And was Sweden’s 2015 win an omen? There’s a vote coming up which will determine the very future of the European Union – and it’s called The Eurovision Song Contest. The last time UK voters were given a choice to be in or out of the EU, they’d just decided to give our European neighbours douze points – and it came on the back of a relatively successful night for the UK in Eurovision. That was long before Bucks Fizz, Katrina and the Waves or even Scooch…so we thought we’d take a look back to 1975 to find out what was going on in Eurovision in the run-up to the last EU in-out referendum. For starters, in 1975 the Eurovision Song Contest was held in Sweden – surely no coincidence it’s back there in 2016? It doesn’t seem to matter whether we win or lose – but as runners up in 1975, a relatively successful night certainly generated a lot of mutual love for our continental neighbours and might be considered a boost for the “In” campaign in 2016 too. Netherlands group “Teach In” won with “Ding-A-Dong” – and crucially they sang in English…even if it was utter nonsense. 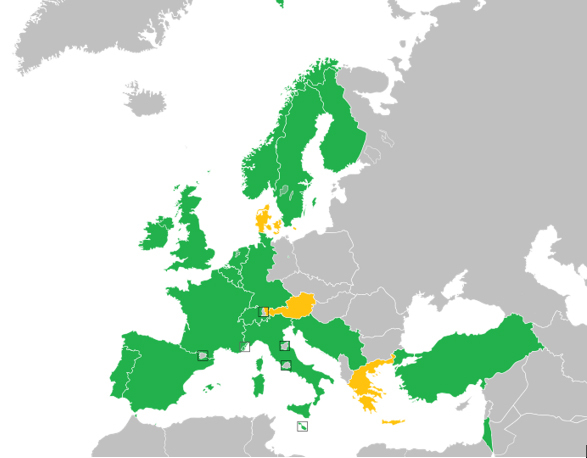 Eurovision has grown rather a lot since 1975, but as you’ll see from the image below, while it may seem odd that countries like Azerbaijan and Australia are now included, even way back in 1975, countries like Israel were joining in the fun – and they aren’t a part of Europe either. And those who think that the Eurovision has become too political might want to look back to 1975 – the year Greece withdrew because Turkey had, rather inconveniently, invaded Cyprus. Then of course there was the Portuguese entry who wanted to sing in army uniform carrying a gun to highlight the Carnation Revolution. Despite all the internal politics, the Eurovision Song Contest is generally a force for good, with disputes settled mostly through the use of interpretive dance, tambourines and chiffon. The Shadows (minus Cliff) were runners-up in 1975 with “Let Me Be The One” scoring 138 points to The Netherlands’ 152 with not a single shot fired. So, it seems that if you want to gauge the outcome of the 2016 Brexit vote based on the results of Eurovisions past, you might do well to keep a key eye on Douwe Bob and whether the UK’s love-in with our tulip-loving neighbours across the North Sea results in tactical voting. What we’re all wondering, is what happens if Australia wins? How will everyone afford the plane fares down under next year? And if Russia wins, will there be a human rights boycott? A win for either nation will pose a headache for contest organisers in 2017 – and might, just possibly, trigger a Brexit.